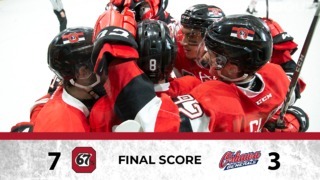 In a game that was fun all night long, the Ottawa 67’s extended their winning streak to seven games on Friday night with a 4-3 overtime win over the Guelph Storm. Kyle Maksimovich took a feed from Lucas Chiodo with 51 seconds left in the extra frame as the two trade deadline acquisitions teamed up to send the crowd home happy. Mitch Hoelscher opened the scoring just over two minutes in, but the Storm would even things up a minute later. 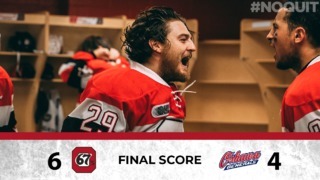 The game stayed even until nearly eight minutes into the second when Guelph would take the lead. Marco Rossi scored his 13th of the year five minutes later to even the score, while Noel Hoefenmayer would give his team the lead midway through the third. A Nick Suzuki goal late in the third forced overtime. Starting his second game in as many nights, Mikey DiPietro picked up his second-straight win, making 30 saves in the process. 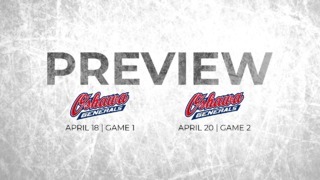 The 67’s return to action on Saturday night when they host the Niagara IceDogs at The Arena at TD Place. With two points tonight, including the game winner in overtime, Kyle Maksimovich has now extended his point streak to five games, in which he totals 10 points. Ottawa had a good night on the power play, scoring two goals on three opportunities. With two helpers tonight, Tye Felhaber extends his point streak to eight games, in which he has put up a total of 15 points. This was Maksimovich’s third game winning goal of the season. Ottawa was dominant on the faceoff dot, winning 39 out of 61 faceoffs.